← Lights Out! Get your melatonin. Summer is fattening. Don’t do it in winter. 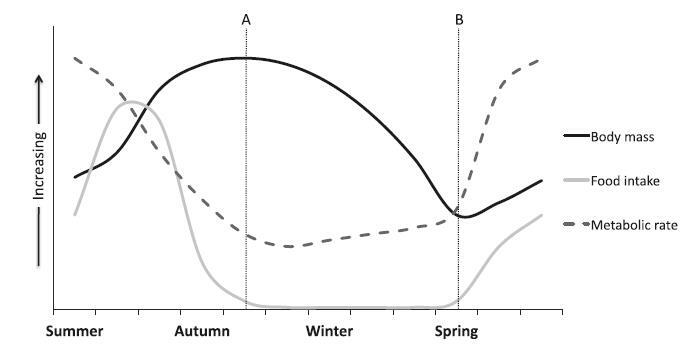 More on seasonal eating in what appears to be the primary model for its justification for use in humans – hibernating mammals. How it goes, or so they say: in summer, hibernators massively overeat, including carb-rich foods, in order to generate muscle and liver insulin resistance, so as to promote body fat growth. The long light cycle reduces evening melatonin, which pushes back the usual nighttime peak in prolactin, which causes an abnormal resistance to leptin, which induces hypothalamic NPY and subsequent carbohydrate craving. Ergo, summer is fattening. In today’s day, increased artificial lights guarantee year-round pseudo-summer; and we no longer experience the benefits of the short light cycle: longer sleep times (akin to hibernation) and fasting – either complete fasting as in hibernation, or pseudo-fasting, ie, a ketogenic diet. There are a lot of steps in this line of reasoning: light exposure –> melatonin –> prolactin –> leptin –> NPY –> carbs –> obesity. 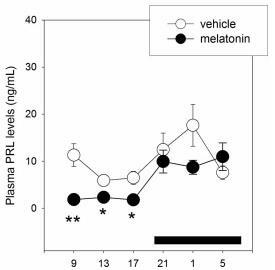 Park (2012) reported that prolactin improves insulin sensitivity – lower overall prolactin during long light cycles would support this, ie, when fat mass is growing (prolactin is supposed to be a winter hormone, but it’s only supposed to be elevated at night, after the melatonin surge… shorter sleep times cause prolactin to ‘spill over’ into the daytime = timing matters). Also, dopamine antagonists (winter brain) increase prolactin whereas dopamine agonists decrease it. 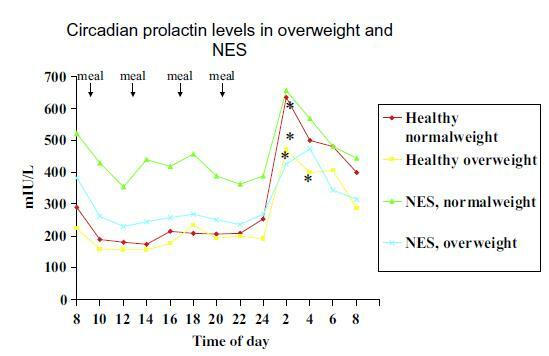 Bromocriptine (summer brain), a classical prolactin antagonist, also reduces leptin (low leptin = hunger, sometimes, which isn’t exactly the same thing as leptin resistance, but may be seen to have a similar effect in some contexts). 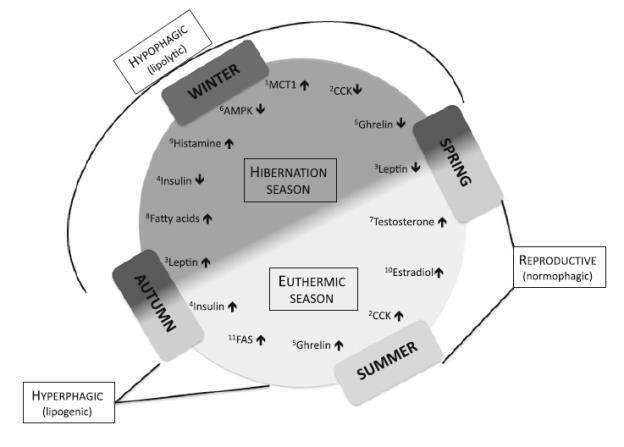 Furthermore, Park (2011) showed that ketones, which would be elevated during winter (hibernation or on a ketogenic diet), improve leptin sensitivity; thus, it might be concluded that lower ketones, as promoted by a high carb summer diet, reduces leptin sensitivity (also supported by the effect of fructose, found in summer fare, on leptin sensitivity). The leptin-NPY connection doesn’t require fact-checking. It is known. 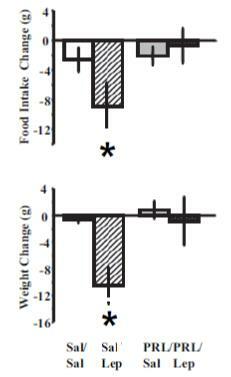 Wang (1998) showed that rats who naturally prefer carbs over other macronutrients had higher NPY levels. This alone wouldn’t suggest causation, but in combination with Glass’ findings above and Welch’s (1994), I’m comfortable saying that NPY causes animals to “crave” carbs. So there you have it. It’s stringing together many different lines of logic, but it makes sense (prolactin is the tricky one, imo). Lots of indirect, independently sourced pieces of evidence to suggest that summer is, indeed, fattening. Don’t do it in winter = turn out the lights and go keto. This entry was posted in Advanced nutrition, Bromocriptine, circadian, diet, Dietary fat, Dopamine, empty calories, Energy balance, fat, Fructose, insulin, Leptin, TPMC and tagged body composition, calories proper, carbohydrates, circadian rhythm, diet, energy balance, insulin, ketogenic, leptin, sugar, summer, winter. Bookmark the permalink.